Vitamins in Animal and Human Nutrition contains concise, up-to-date information on vitamin nutrition for both animals and humans. The author defines these nutrients and describes their fascinating discovery, history and relationship to various diseases and deficiencies. Discussion of vitamins also includes their chemical structure, properties and antagonists; analytical procedures; metabolism; functions; requirements; sources; supplementation and toxicity. Vitamin-like substances, essential fatty acids and vitamin supplementation considerations are also examined. This book will be useful worldwide as a textbook and as an authoritative reference for research and extension specialists, feed manufacturers, teachers, students and others. It provides a well-balanced approach to both animal and clinical human nutrition and compares chemical, metabolic and functional aspects of vitamins and their practical and applied considerations. A unique feature of the book is its description of the implications of vitamin deficiencies and excesses and the conditions that might occur in human and various animal species. 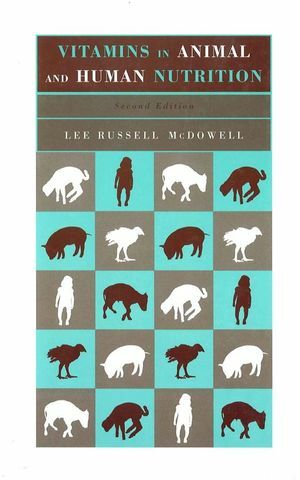 Lee Russell McDowell is the author of Vitamins in Animal and Human Nutrition, 2nd Edition, published by Wiley.